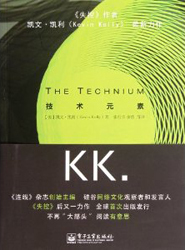 THE TECHNIUM is a selection of essays taken from The Technium blog. Only posts written prior to 2012 will appear in the book. The original essays (written in English) have been translated into Japanese or Chinese; each book selects a different list of posts. This book is not available in English, although of course, the original blog posts are, plus the many essays not included in the book. They can be found at The Technium. The Chinese Edition was translated by Zhang Xingzhou, Yu Qian, Zhou Feng, Guan Ce, Jin Xin, Zeng Danyang, Li Yuan; (张行舟, 余倩, 周峰, 管策, 金鑫, 曾丹阳, 李远). The Japanese Edition was initiated by Sakaiya Shichizaemon, who translated some of my essays for his own enthusiasm, and suggested doing a whole book. He selected and translated all the essays in the book.